Neatly store items for easy retrieval with this Better Homes and Gardens 6-Shelf Organizer! 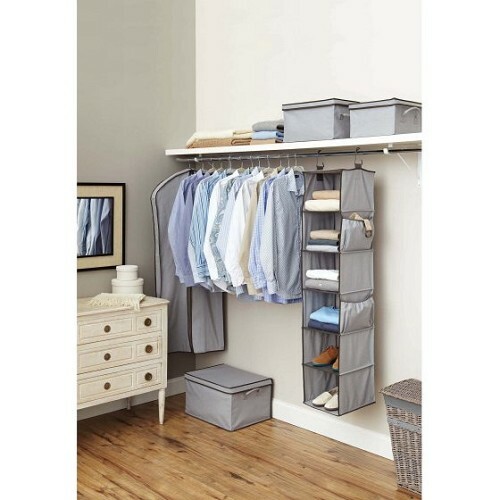 This Better Homes & Gardens 6 Shelf Organizer in particular includes six separate shelves capable of storing clothing, shoes, purses and so much more. 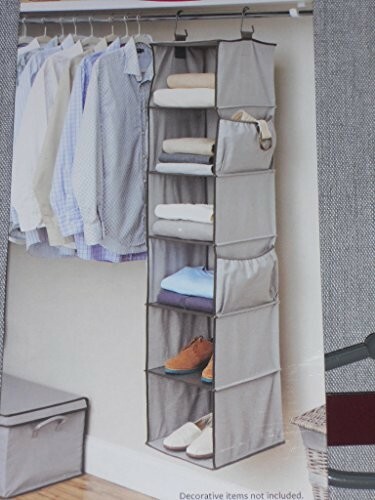 Also, this product has four side pockets, two on each side of the unit, which can store multiple smaller items that you cant ever seem to find a spot for such as belts, scarves and an abundance of other objects. This closet storage organizer comes with durable metal constructed hooks designed to hang from most closet rods. 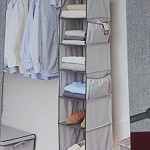 The newly designed 6 Shelf Organizer from Better Homes & Gardens comes in a trendy grey flannel look that is far more appealing than those old solid white and black colors. Dont be left out when looking to transform an old closet, get a step ahead and try the new Better Homes & Gardens 6 Shelf Organizer!